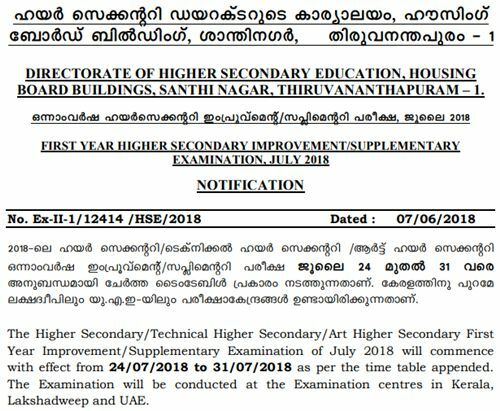 Kerala DHSE First Year Improvement/Supplementary Time Table July 2018: The Higher Secondary/Technical Higher Secondary/Art Higher Secondary First Year Improvement/Supplementary Examination of July 2018 will commence with effect from 24/07/2018 to 31/07/2018 as per the time table appended. The Examination will be conducted at the Examination centres in Kerala, Lakshadweep and UAE. Candidates who have appeared for all the six subjects at the First Year Higher Secondary Examination, March 2018 can register in this examination for upto three subjects for improving his/her scores in those subjects. Candidates who have registered for the First Year Higher Secondary Examination, March 2018, but could not attend the First Year Higher Secondary Examination, March, 2018 due to various reasons can register for all subjects for which they were absent. In addition to registering for the absent papers such candidates can also register for improving the scores of upto three papers of the appeared subjects. For eg. a candidate who had appeared for four subjects at the First Year Higher Secondary Examination, March 2018 and was absent for the remaining two subjects can register for the two subjects for which he/she was absent and also register for improving the scores of any three subjects which he/she attended at the First Year Higher Secondary Examination, March 2018. A candidate who was absent for all six subjects at the First Year Higher Secondary Examination, March 2018 can register for all six subjects. Regular candidates who have appeared for all six subjects at the First Year Higher Secondary Examination, March 2018 or this First Year Improvement Examination, July 2018 alone are eligible to register for the Plus Two Higher Secondary Examination, March 2019. Candidates admitted to the Second Year Higher Secondary course from other Boards/Institutions during 2018-2019 shall register and appear for all subjects in this supplementary Examination as lateral entry candidates. They shall undergo Continuous Evaluation in all six subjects of First Year Higher Secondary course. They shall be eligible for registering for the Second Year Higher Secondary Examination March 2019 only if they appear for the First Year Higher Secondary Examination in all subjects, at this Examination. The candidates re-admitted for the Second Year Higher Secondary Course in 2018 and the candidates who cancelled their 2018 Second year examination shall be eligible for getting retained their scores obtained in the first year higher secondary exam previously. The candidate who cancelled the Second Year Exam should attend both the theory and practical examination as the practical evaluation score obtained will be cancelled along with the examination cancellation.